T-80BV tanks, Red Square, Moscow at the 2005 Victory Day Parade. Which Central Asian Leaders Are Attending Russia's Military Parade? 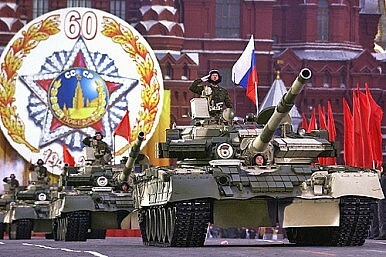 Kyrgyzstan and Tajikistan have recently rescheduled their Victory Day parades so their presidents can attend Russia’s. May 9 is Victory Day throughout the former Soviet Union, commemorating the surrender of Nazi Germany. The Soviet Union viewed the German surrender at Reims, France on May 7, 1945 as preliminary, as it had no representative present who had the authority to accept the surrender. A subsequent surrender, signed in Berlin late on May 8 (which was already May 9 in Moscow) ended the war for the Soviet Union. This year’s schedule of military parades across Europe and the former Soviet Union mark 70 years since the end of the war. The Moscow parade promises to be a lavish affair, featuring 16,000 soldiers and over 200 pieces of Russian military hardware. Similar parades will be held across Russia. According to Russian media the Moscow parade will include T-90 battle tanks, GAZ-2975 Tigr infantry mobility vehicles, BTR-80 armored personnel carriers, and 2S19 Msta-S self-propelled howitzers, as well as an accompanying flying parade of MiG-29 and -31s, various Sukhoi Sus, and Yakovlev Yak-130s for the first time. The parade is also scheduled to feature for the first time three RS-24 Yars mobile ICBM launchers. Kyrgyzstan and Tajikistan this week announced that they would move their own Victory Day parades, both previously scheduled for May 9, to May 7 as their presidents, Almazbek Atambayev and Emomali Rahmon, will be attending the events in Moscow. The Guardian reported that Uzbekistan’s Islam Karimov and Turkmenistan’s Gurbanguly Berdymukhammedov have confirmed their attendance as well. Kazakhstan, too, is holding its own parade on May 7 — featuring 3,500 soldiers and modern, as well as “retro” military equipment. There’s no word yet on whether the Kazakh President (who nominally stands for reelection Sunday) will attend but reports from Ivestia in March indicated he would. While the planned attendance of North Korea’s Kim Jong-un is most likely to cause the biggest stir if indeed it happens — it would be his first official foreign trip — the attendance of all five Central Asian leaders may also be a first. Only the leaders of Tajikistan, Kazakhstan, and Turkmenistan attended in 2010. It seemed for a while that all the members of the Eurasian Economic Union (EEU) would be in attendance but Belarusian President Alexander Lukashenko pulled out to attend the Victory Day parade in his own capital, Minsk. Kyrgyzstan is currently acceding to the EEU and is expected to join fully in May while Tajikistan has also expressed interest. The “Obkom” is a Soviet term for a Communist Party committee and his use of it suggests that post-Soviet states and some activists in Russia follow orders from the United States. German Chancellor Angela Merkel, who attended the 2010 parade, is compromising on the matter. She will be avoiding the May 9 parade but intends to travel to Moscow the day after to lay a wreath at the war memorial.